Hello my dear friends and supporters, Thank you for reading my posts and checking out my drawings and paintings, your support and feedback means more to me than you can ever know. I have something very cool to share with you in this post, something that coincidentally is very timely on this Valentines weekend. One of my followers on Instagram saw this picture I posted and asked if he could write a story about it. Instagram is quite difficult to write a story on, as it limits your comments to 250 characters. I was blown away by the beautiful story @jcenno posted with my drawing. I hope you enjoy it and check him out on Instagram for more stories and check me out @emeljurd to see lots of shots of my drawings, paintings and other creative exploits I also promise that I am working behind the scenes and will be updating my website soon with a new look, new paintings and PayPal! The tear glistened like a liquid heart as it fell into the dirt. I’ve known her for longer than I can remember. Watching her grow toward the sunlight, persevering through the winters and embracing the springs. Each time she opened herself up, she knew it might lead to limbs breaking and hearts splattering the ground like fallen fruit. Each time she would pick herself up and grow stronger. Sometimes I helped but most of the time I just listened. I had only one concern. 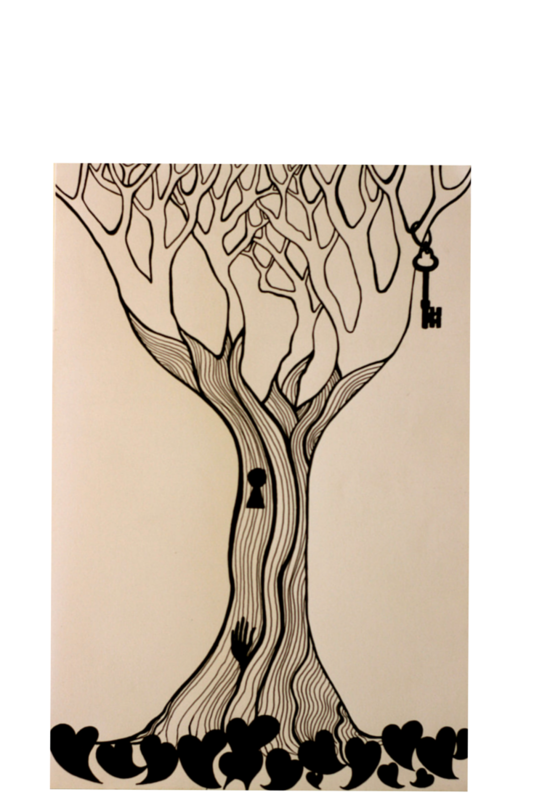 She grew stronger yes but her key was soon becoming out of reach. In a branch buried so high amongst the colourful leaves of her soul that only birds or angels could reach it. I stood amongst the remains and knew each piece intimately; that’s where she took things too seriously, over there was where she wasn’t serious enough, behind that is where she wasn’t pretty, next to where her looks made him jealous, toward the back is where she was considered boring and beneath that is where she didn’t spend enough time with him. Surprised, she let out a shuddering breath as I felt a metal object fall from the sky and hit me on the head.